Using the new method of downloading and installing your apps. 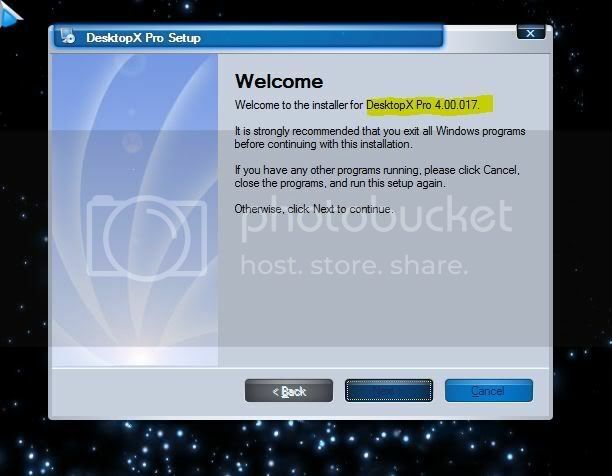 DesktopX Pro 3 is SUPPOSED to be v 3.50.018, however the actual file downloaded is 4.00.017. Please fix this as I refuse to use that worthless version. The non-pro version is the correct download however. could I possibly get a response to this in the reasonable future? email sent.. let's see if the fix comes this year. This brings up a question. Will we eventually see a choice of release or beta versions on this new system? I mean, I now show DesktopX 3.5.060. Suppose I wanted the beta 4.0? How would I get that if it isn't listed? In Impulse, we had the ability to hide/show betas. Will we regain this ability? OK, now this is exactly why people get pissed off at support. I sent the email in and have heard nothing. This isn't a rocket science request either. At least a reply of "Yep, got your request and are looking at it" would be appreciated. Try looking in your spam email folder, Phoon? When did you send the email to support? Please post the auto-reply ticket number. Anyone wanna field reply #5? I think that the long term goal will be to have a full-featured management app. I believe this solution is transnational. well, a full work week has passed since I posted this, and (not surprisingly) the issue is still not resolved. Cmon.. is it really that difficult to fix this? yet another few days passed and no fix. To further muddy the waters, I have another account (from my place of business) in which we were one of those that paid something like $495 for DesktopX Pro when it was first released. Logging in with that account shows the link but that one does not work at all. 10 working days now gone by and not a ! @#$ing peep more on this. PLEASE, fix this issue. All I want is what I paid for and not a piece of crap program that doesn't work! You still got impulse installed it has 3.5 as the most recent if you haven't ticked pre release or it lists 3.91 beta if pre release is ticked. scorpNZ, I'm fully aware of the impusle option, however I am not installing impulse as that is not the official method of downloading apps any longer and I see no reason to jump through that hoop. I can't possibly be the only one in this situation. I received an email from Zubaz on 8-10-11 stating that support is still working on this. Also noticed the ticket status is "On Hold". Ok, what is "On Hold" and more important, WHY is this "On Hold". Why would you guys even think about having DXPro v 4 available for download under a customers apps. Not only is it Beta but it is a complete POS beta that is known to not function even remotely well. I just cant fathom why this is such a hard issue to resolve. I have to agree with Phoon here. I still have Impulse and an Impulse archive for DX Pro. But if I didn't, and I needed to reinstall, I'd have to use 4.0 and I can't work with 4.0. It simply isn't a good working version. You don't even have a way to know which version you have until you begin the install.